The goal of PTS is to measure the care we provide against a standard. This information represents the start of an attempt to establish a standard for the care of injured children. The information was compiled using data from the Pediatric Health Information System (PHIS), a service of the Children' Hospital Association. The PHIS includes information on all kids cared for at the 44 busiest children' hospitals in the US and Canada. The hospital names have been removed to allow the data to be shown widely without anyone knowing the institution. Many of these hospitals are pediatric trauma centers, although some are not. Some are free-standing children' hospitals, but many are a children' unit within a general hospital. Some have clinical practice guidelines for the care of children with certain injuries, while some do not. The PHIS includes information on what kinds of injuries kids suffered; how they were treated; and how much it cost to take care of them. It also includes information on how many of those kids were readmitted to that hospital. The financial data has been adjusted for the different parts of the country. We'e calculated the Injury Severity Score for each patient, the most widely accepted measurement of how badly someone is injured. For the first topic we decided to use spleen injuries. Spleen injuries are a common problem in children and one condition whose management should be fairly straightforward at a children' hospital. We looked at kids 15 years of age or younger who had suffered an injured spleen in the PHIS database from 2005 through the end of 2010, 6 years in all, and looked at a number of things, as you can see in the graphs that follow. Hopefully you can use these data to compare with your institution' splenic injury management. There are many other ways these data could be presented. Please email David Mooney with your concerns or suggestions on ways to present this in a way you would find more useful. Also, please email with ideas for other topics to be displayed. 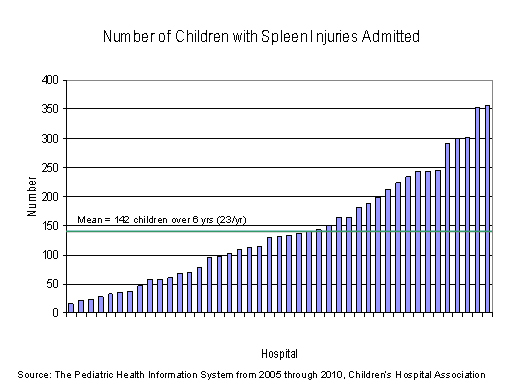 The first graph shows the number of kids with a splenic injury who were admitted to one of the PHIS hospitals from 2005 through 2010. Each vertical bar is a different hospital, and they admitted from 16 to 357 children with splenic injuries over the 6 year period, or from 2 1/2 to nearly 60 kids per year. The green line is the average number, and shows that the average hospital admitted around 23 kids a year with an injured spleen. The hospitals will be listed in the same order in the graphs after this, from the slowest to the busiest, so you can see the influence of the hospital' annual volume of this problem on things like the splenectomy rate, the readmission rate and the cost of care. To view the additional data login to the members only area. Your dues balance must be paid in order to view this study.